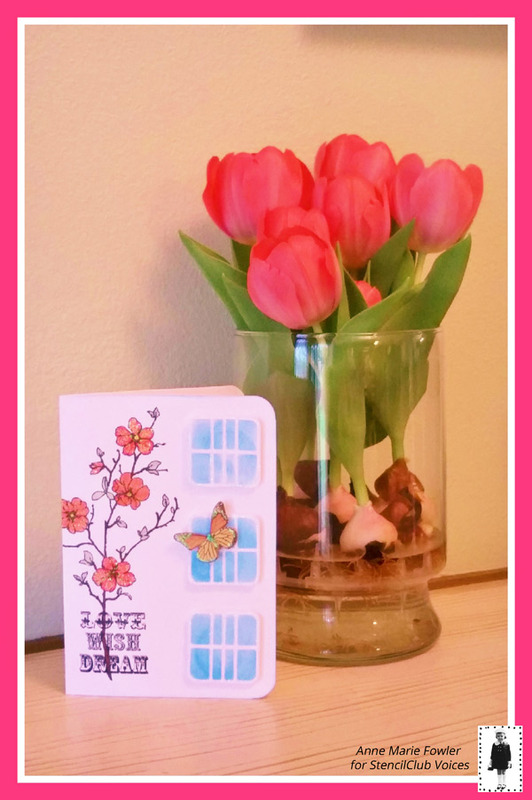 Our Voices for June, Anne Marie Fowler, Hope Malott, Kim Villareal, and I, Carol Baxter, certainly went all out with the Floral Facets Collection Carol Wiebe designed for StencilClub. I shall let our fabulous StencilClub Voices take it away! For this project, I took a decorative piece of wood that I picked up in an antique store. After turning the item every which way, it started to dawn on me that one portion appeared to be a crown. My dissertation focused on two empresses, one of whom was Empress Wu Zetian, so I was thrilled to have been able to celebrate her in this creation. I used the 9 x 12 inch stencil to create the Empress’s gown. 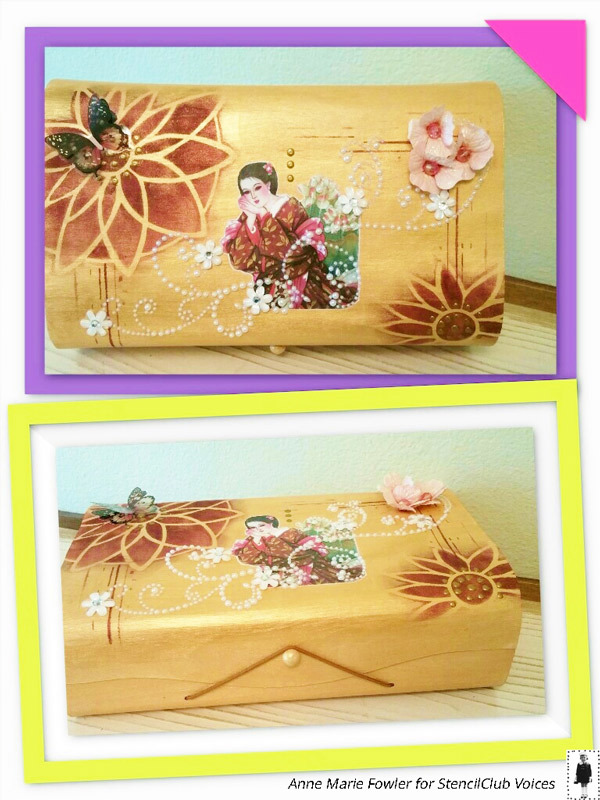 For this stencil, I opted to create a love letter box in the spirit of the Japanese pillow box. In case you haven’t noticed, I love Asian art. This box would be a great place to secret away the love letters one receives from admirers and lovers. For the final project, I worked to incorporate the stencil as a main aspect but not one that was overbearing. I felt that using it as a raised element of a card would be wonderful. I like the feeling of the stencil being a type of screen that the butterfly wants to languish on. 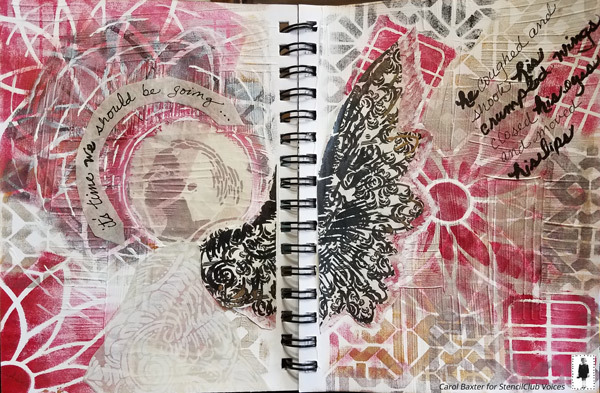 The June stencils were fun to work with! 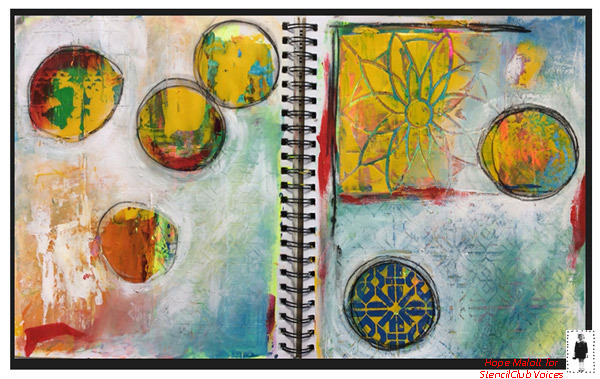 I used a combination of modeling paste, heavy body paints, Neocolor II crayons, and Derwent Inktense pencil to create a textural journal page. The three stencils worked well together. The smallest one with the geometric blocks are harder to find but if you look close you'll see then on the left page in the upper corner. The stencils left amazing pattern and texture, some very subtle and others very heavy. I decided to begin a musical themed art journal. Carol's Floral Facets stencils paired well with the Fractured Angel stencil I already had to show a few lines from a Bowie tune. The lines beneath the stenciling were created with a heavy body gesso that I impatiently waited to dry. I just kept playing with the StenilClub set for my background which granted me Zen moments in my afternoon. This month I explored a new material, a paper made from stone. 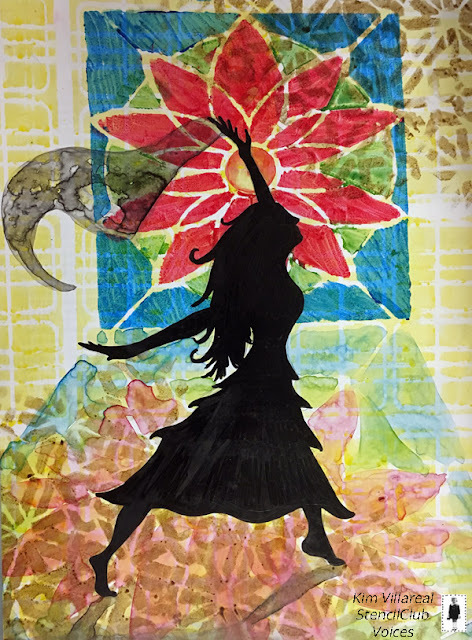 The 'Dancing Girl' was acrylic ink and sharpie on stone paper. I had recently watched Beauty and the Beast and felt that the flower was much like a stained glass window. The large stencil much like a tiled floor. 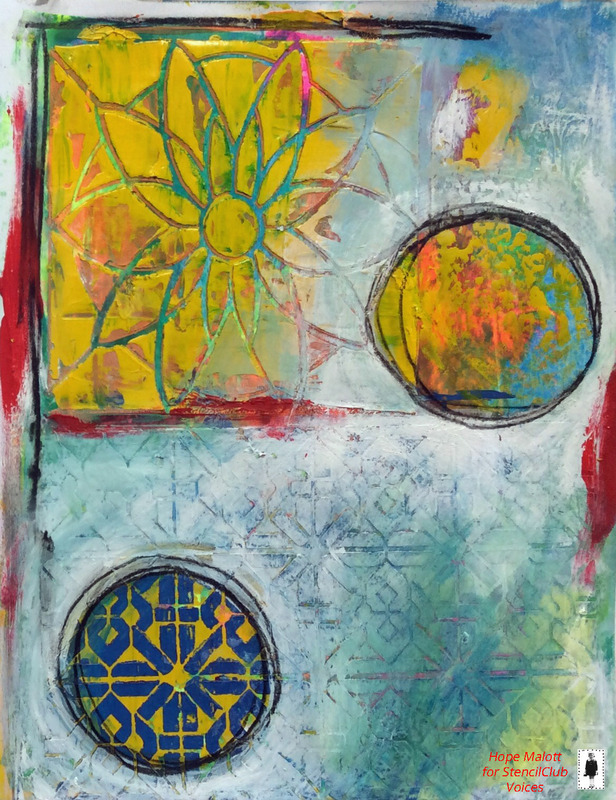 The other piece, 'Centered', featured the same cool paper and my small round geli plate. 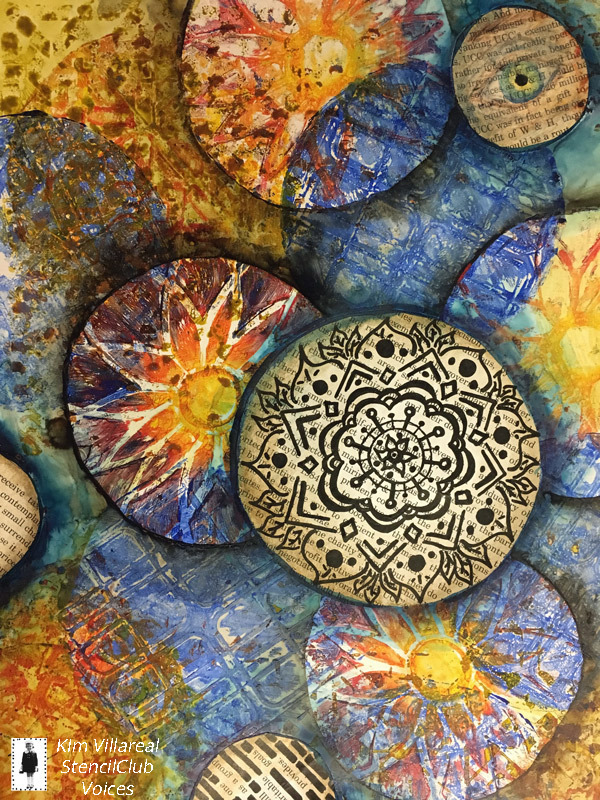 Most of the circles were using acrylic paint outlined with an acrylic ink wash. The print was a page torn out of a book on non profit law. The eye was drawn with pastel pencils, the mandala and black out poem with black brush pen. The inspiration for this piece was the altered books my Art 3 students were working on this month. Missed Carol Wiebe's Reveal video? You'll find it HERE. 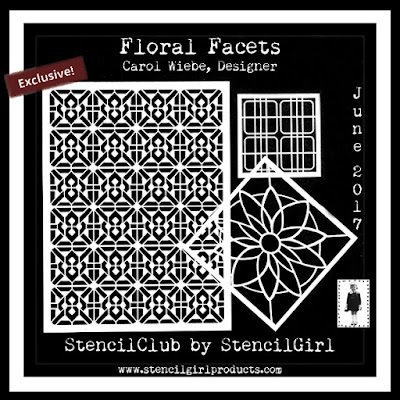 If you want Carol's exclusive June 2017 Floral Facets Collection you can join StencilClub HERE. 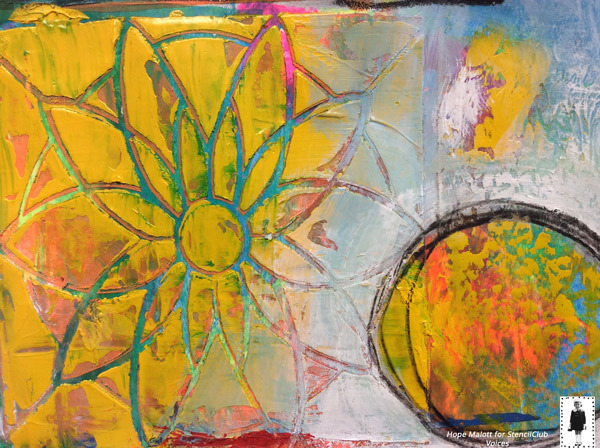 If you crave even more stencils by Carol, you'll find her page HERE. WOW!!! I am so excited by what you wonderful artist have made with these stencils. Thank you, Anne, Hope, Kim and Carol. I bow to your creativity.